A lot of rock acts from the ’80s and early ’90s seem to be getting a second chance these days thanks to retro-minded labels like Eonian Records. The New York-based Strike Twice is one of those acts. After having formed in 1985, the band reunited in 2008 and in 2009 Eonian has brought us this compilation of recording sessions from 1989, 1990 and 1991 (that enough dates for ya?). As near as I can tell, the band never had any official release previous to this album, but the sound quality is very good from these sessions and these tracks are certainly not demo quality. These are honest-to-goodness well-produced recordings for the most part. Had an album been released by these guys in the late ’80s, I can definitely see them having some success. Maybe not on the level of Poison or Motley Crue (though singer Michael Hayes does remind me of Vince Neil) or Ratt, but the music is solid radio-ready melodic ‘n’ sleazy hard rock. If the band had scored an album deal back then, they would probably be a cult fave now. I think where Strike Force went wrong is that instead of taking time to build a buzz with an indie label, they went straight to the majors trying to get a deal. Sometimes it works, sometimes it backfires. Back to the songs themselves, there’s some inspired sleazy moments here. “Intoxication”, “Dirty Lover” and “Undress Me” are just as raucous as they sound, “Back Door” is an ode to… well, you know and “Wake Up Cryin'” is a worthy entry into the Great Hall of Power Ballads and it features just enough bite to not come off as too wimpy. 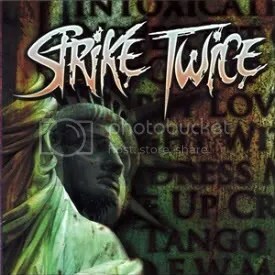 Now that the band is back together playing dates and they’ve gotten their older material released, I really hope to hear some new material from Strike Twice in the next year or two.